Isn’t it funny where an idea can take you? When Brooks Caretta and Leo di Vicenzo waded into the sea off Sydney’s Northern Beaches to collect some salt water to put in a beer recipe, the two Italian brewers couldn't have imagined that the result would become a defining beer for the Nomad brewery. The beer was to become Freshie, a German style Gose that makes use of salt water and Tasmanian mountain pepper. 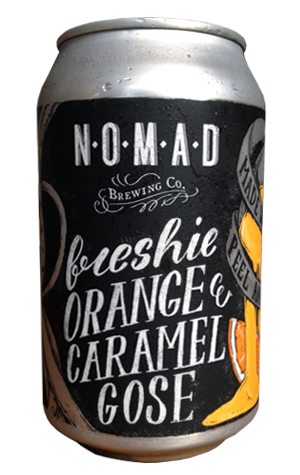 At that point there were few other Aussie breweries making gose but Nomad’s became popular locally, then nationally and was duly dispatched around the world where it’s been winning fans from Asia to the Americas. Last year Freshie even spawned an offshoot in the shape of Saltpan Desert Gose which featured finger lime and pink salt from the Murray River. And now there’s another in the family. This one’s an orange and caramel version that’s deeper and darker than its citrusy siblings. When you see the word "caramel" on the tin you're inclined to think its going to be sweet, but the caramel comes through more in colour than it does in flavour. As for the orange, there’s no hiding that one. It comes as a result of orange peel having been added to the brew and, you have to suspect, accentuating the citrus and bitter characters of the hops. Despite the additions it still very much feels like you're drinking a Gose, with the salt character showing itself in its inimitable way. With three incarnations, the Freshie family is now officially expanding with the seasons so it’ll be interesting to see what’s coming next.